Having been raised on the Mississippi Gulf Coast, I had the pleasure of spending my summer days and nights fishing the Gulfport area waters. Those were the happy-days for sure. From pulling a seine to throwing a cast net we would gather our own bait and hit the water In search of Speckled Trout. In those days the Shrimp harbor was a great place to sit and watch the boats come and go. As I got older my friends and I would catch the Ship Island boat and camp out around the old lighthouse and fish all weekend. We just loved the water and to this day I still do. Now days I run the “Reel Outlaw”, a 24’ Glasstream and try to hit the water at least three days a week year round. 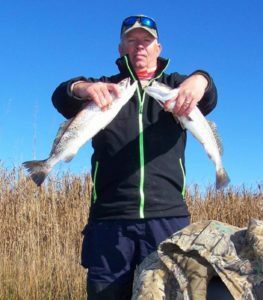 Jig fishing the near-shore and off-shore reefs for Speckled Trout and Red Fish is my speciality. Springtime and Fall is my favorite time of the year, but the best time to go fishing is when you can….